In an inexplicable abdication of any semblance of responsibility or leadership, Donald Trump has announced that he will begin the process to withdraw the United States from the Paris climate treaty, joining Nicaragua and Syria as the only world countries rejecting the agreement. It now seems inevitable that the history books will view Trump as Americas worst-ever president. If I and my advisors had never learned what Science is or how & why it works, then Id consider pulling out of the Paris Climate Accord too. Trumps withdrawal from the Paris treaty is a mostly symbolic act. Americas pledges to cut its carbon pollution were non-binding, and his administrations policies to date had already made it impossible for America to meet its initial Paris climate commitment for 2025. The next American president in 2020 can re-enter the Paris treaty and push for policies to make up some of the ground we lost during Trumps reign. However, withdrawing from the Paris treaty is an important symbolic move a middle finger to the rest of the world, and to future generations. America is by far the largest historical contributor to climate change. Ironically, on the heels of Trumps claim that most NATO members arent paying their fair share to the organization, America has announced that we wont do our fair share to curb the climate change threats that we are the most responsible for. And the GOP has become the Party of Trump. His decision was reinforced by a letter from 22 Republican senators urging withdrawal from the Paris climate treaty. Those senators have coincidentally received over $10m in donations from the fossil fuel industry over the past five years. Environmentalists will argue that these [Clean Air Act] Section 115 requirements are, in fact, met more easily by the Paris Agreement because it includes enhanced transparency requirements in Article 13, which establishes a process for nations to submit plans to reduce emissions to one another and then to comment on the plans of one another. They are making things up. EPA did not rely on Paris to justify the Clean Power Plan, and none of the parties defending the Plan has cited Paris as a legal basis. On Clean Air Act Section 115, no one I know has made, or even thought of, this argument. Its difficult to discern the Republican Senators motivations behind this letter. Even big oil and coal and many of Americas largest companies supported America staying in the Paris agreement. Industries dont like the uncertainty involved in lurching in and out of international treaties, and experts are concerned about the effect on Americas international influence from tearing up this critically important agreement that we helped broker less than two years ago, that was signed by nearly every world country. Perhaps the Republican Senators are trying to ride Trumps nationalist, anti-globalist coattails. Maybe they think that their right-wing base will be excited if they stick it to the rest of the world on Paris. 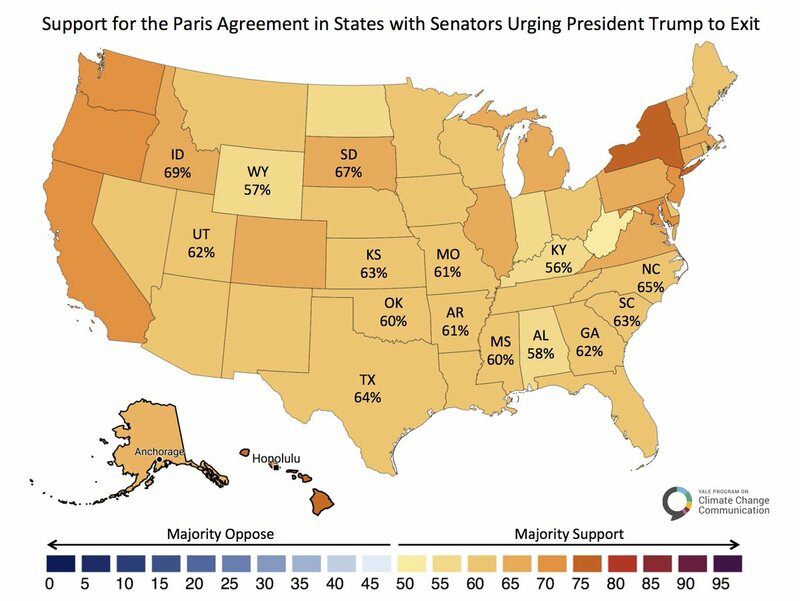 However, majorities of voters in every single county in the US support regulating carbon as a pollutant, and 71% of Americans (including 57% of Republicans) think the US should participate in the Paris agreement. In short, efforts to pull out of the Paris treaty are woefully misguided, and almost everyone knows it. Everyone except 42% of Senate Republicans including leader Mitch McConnell, James Inhofe, Rand Paul, Ted Cruz, and of course Trumps senior advisor Steve Bannon and his EPA administrator Scott Pruitt. Additionally, the Koch brothers and Vladimir Putin are not fans of the treaty. Those two factors may best explain this decision by Trump and the Republican senators. Some Republican leaders are struggling to preserve their partys credibility and viability. Senators John McCain (R-AZ) and Lindsey Graham (R-SC) warned against the withdrawal. 20 House Republicans have now joined the bipartisan Climate Solutions Caucus, whose goal is to craft economically beneficial climate policies that both parties can support. And a group of Republican elder statesmen including Secretaries of State and Treasury to Presidents Reagan, George HW Bush, and George W Bush met with the White House seeking support for a revenue-neutral carbon tax plan. So far, these leaders laudable efforts have failed. Trump and the majority of Republicans in Congress are doing everything they can to increase American carbon pollution. They want to repeal all of Americas climate policies with no replacement plan. In short, theyre happy to let the world burn, and for our children and grandchildren suffer the consequences. This is the rotten state of todays GOP. Theyre happy to sell out the future of humanity for their own short-term political gain. Noam Chomsky was right the Republican Party may be the most dangerous organization in human history. This move comes at a time when the need to act on global warming has been clear for decades, but the GOP has blocked all American climate policy efforts, and were now running out of time to avoid dangerous climate change. Trump, per a source, will follow the 4-yr rule to get out of Paris, meaning the US will leave on Nov 4, 2020. Election Day 2020: Nov 3. Americas withdrawal from the Paris treaty will take four years, meaning that the 2020 election (and the 2018 midterms) will be a referendum on Trumps decision today. American voters must send the world a signal in that election. In the meantime, it will be up to the rest of the world – particularly China and the EU – to take up the mantle of leadership on climate change that America has left behind.